Serious gaming on a _phone_ or tablet is always a so-so experience. The games themselves may hold lots of potential, but the fact that you are limited to only using virtual touch controls on a cold and lifeless glass panel removes a great deal of precision, as well as the satisfaction of tactile feedback when pushing a trigger. Which is precisely why there are controllers out there, specifically meant to pair with mobile devices. 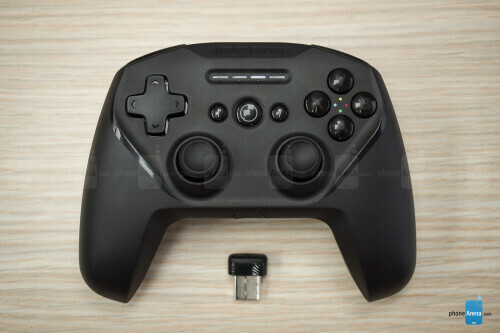 And the good news is that any game developer that takes their product seriously will sooner or later add controller support for their Android or iOS game. 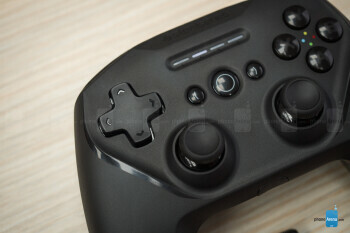 But a good controller is a costly controller, and that holds true in the mobile world as well. 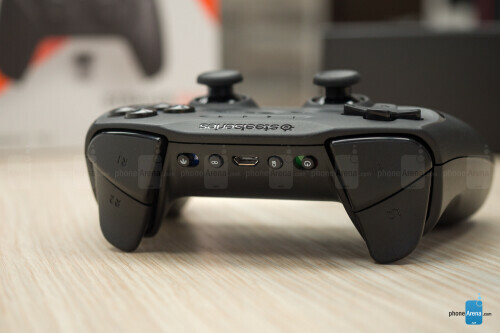 When a gamer is greeted by a $60 price tag on a mobile gamepad, it's very easy to say "I'd rather spend that $60 on a controller for my main gaming rig and forget about playing on the phone", and that's a pretty sound argument. So, in comes the SteelSeries Stratus Duo, seeking to give you a two-in-one offer that you can't possibly refuse. Equipped with protocols for both Bluetooth and 2.4 GHz wireless (dongle included), this multi-platform controller can very easily hop between being connected to your PC, your phone, or your tablet. Sounds pretty neat. But is it a good controller in the first place? We took it for a spin! We found that it is extremely comfortable to hold — as soon as we grab the device, its curvy sides guide our fingers to a firm hold and a secure fit. The black plastic's matte finish feels soft and pleasant to the touch and it does not attract fingerprint grease easily. The whole gamepad feels sturdy and there are no creaks and pops as we try to twist it in our hands. 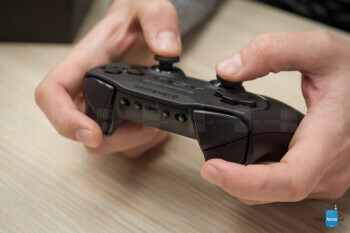 Since it's meant to work with your PC games as well as with your Android devices, the Stratus Duo sports every button you can find on your mainstream controller — from a D-Pad to two pressable analog joysticks, four buttons on the front, four shoulder buttons, as well as the all-time favorites — start, select, and home. We appreciate that the D-Pad has a directional cross shape, instead of it being a wishy-washy circle, making it easier to use in fighting games where hitting the right direction at the right time can make or break your combo. All of the buttons have a decent amount of travel to them with a reassuring, yet soft click to them. This makes the Stratus Duo one of the more silent controllers we've used recently, but we can't know whether the components get clankier with time just yet. 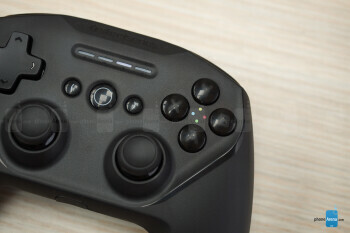 The shoulder buttons are super big and comfy to press, which has the minor downside of your index finger needing more travel time when switching from R2 to R1. But that's a minor gripe, easy to offset once you get used to handling the Stratus' shape. You can connect the Stratus Duo to a Windows PC, an Android device, Samsung's Gear VR or the Oculus Rift and Oculus GO. There's no extra software required — it's plug and play through and through. 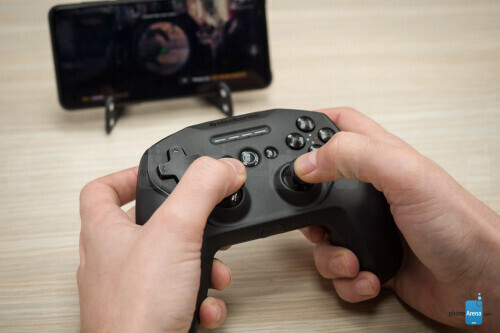 The controller even supports Steam and Big Picture Mode, making it hassle-free to jump in a game (or a home stream). If you are currently connected to one device but want to switch to the other — it's easy. 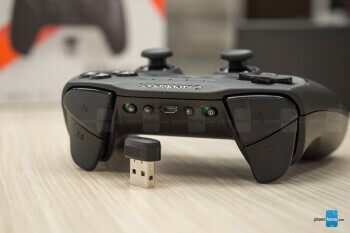 Just press a "disconnect" button at the back of the controller and it will instantly go back to pairing mode, waiting to connect to the next device. The gamepad has a standard micro USB port for charging or for connecting to your PC via a standard wired connection. It's a bit of a bummer that a brand-new product doesn't use USB Type-C, but not a dealbraker at this point. As you can tell, we do like the Stratus Duo. But we were a bit disappointed to find that it doesn't have a clamp to hold a smartphone while gaming on the go. 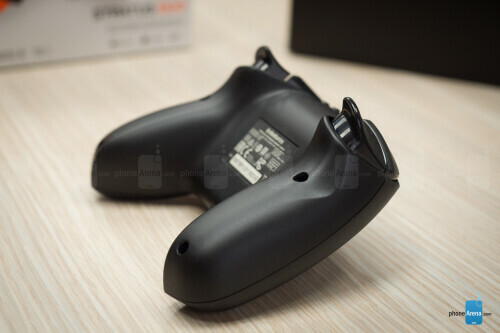 Then, we visited the SteelSeries website and noticed the SmartGrip — a clamp that's compatible with all current SteelSeries controllers and can hold a smartphone right over your gamepad while you game. It's a separate purchase of $10. We are only a tiny bit disappointed that it wasn't an included item with the Stratus Duo — adding it in the box would've made the controller a pretty attractive deal. Still, the Stratus Duo + the SmartGrip will cost you $70. We do recommend you consider getting the full package since you never know when you might need a _phone_ clamp for some on-the-move gaming! 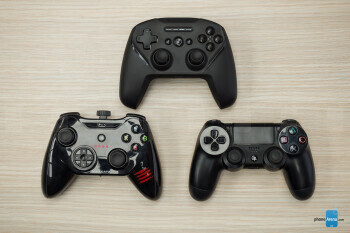 It's pretty hard to stay afloat in the controller market nowadays — especially since the gamepads that readily come with the super-popular Xbox and PlayStation consoles have become compatible with everything out there. So, it's a breath of fresh air when we see a new product in the segment, especially one that can fill a gap in the market and be on par, quality-wise, with the competition. If you are in need of a controller for your PC that just so happens to also work flawlessly with your Android devices — you can't go wrong with the Stratus Duo.